Saturday night, September 7th, I time-traveled to the 1970s. That was the decade of my last two years of high school, my tenure in college and the early years of my adventures in radio. Think of what defines those years for you and most likely you’ll be drawn to the songs that were playing on the radio at the time. That night, I went back to first-dates, breakups, dorm parties and my first radio station with the help of America and The Doobie Brothers. The venue was the Tulalip Resort Amphitheater, where there was some confusion about what time the concert actually started. We heard both 7 and 8 o’clock, so we arrived before 6. With an actual kickoff of 8pm, we had plenty of time to enjoy the sun-drenched setting for the last outdoor concert of this year. The warm-up DJ held steady with the theme: Boston, Steve Miller, Elton John….all the acts this boomer crowd grew up with. By the time the concert began, the crowd was pumped, fairly inebriated and ready for some serious flashbacks to our younger years. The two guys that make up America—Gerry Beckley and Dewey Bunnell—took the stage and reminded us of all the hit songs they had cranked out over the years. While the two were likeable and personable, telling the story of how they met as Air Force brats while living in London, and continuously expressing their gratitude for everyone in attendance, their performances were strained. The vocals didn’t come as easy as they once did and their harmonies didn’t always work. Yet, it was still exciting to see the guys who made those songs I remembered, as well as introducing me to some of the ones I missed deeper on the album. After an hour, there was a quick encore and they reminded us that the Doobie Brothers were coming up shortly. When they took the stage at 9:30, they launched into a tight, upbeat “Jesus is Just Alright” that quickly demonstrated they still had it. For the next two hours, they wowed the crowd with their hits, plus each of the members was allowed to show off their amazing talents. Each is extremely gifted in their musical expertise. No, it wasn’t the original Doobie Brothers, but it was the core—Tom Johnston and Patrick Simmons—who defined their sound and were still able to make it sound fresh. They took their hits and added in long guitar, sax or keyboard solos. The die-hard Doobie fans would have probably recognized everything they played. I was around 95%, but there were a couple of deep album cuts thrown in and now I want to find them. The harmonies were tight, they looked like they were having a blast and they forced an older audience to get up off their weary feet and do some moving. 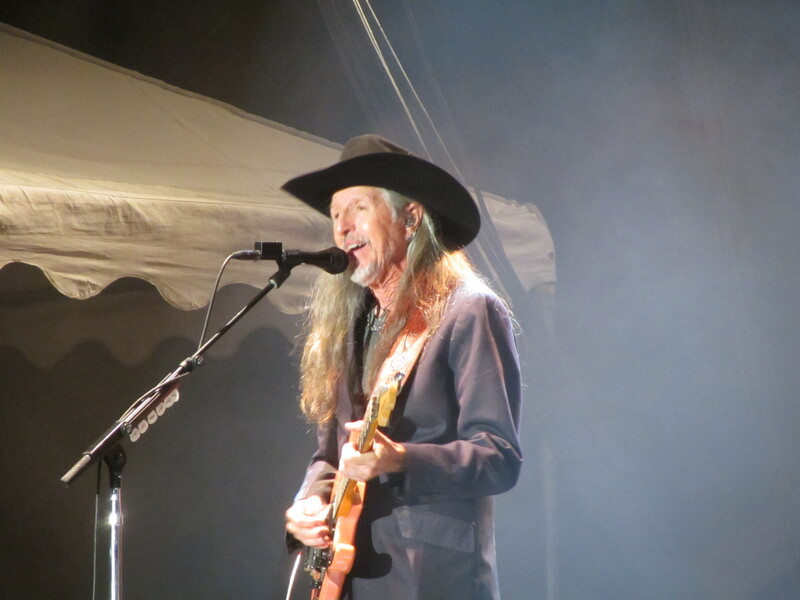 Patrick Simmons reminded the crowd he was born in Aberdeen. Tom Johnston and his voice never sounded better and he spent the entire night playing with the crown, doing what a coach would do to fire you up. America made me realize just how long ago those days were. The Doobie Brothers illustrated just how good the music was. Two different experiences, backed into my flashback night to the 1970s. It was a nice visit. I’ll share just a little bit with you right here.